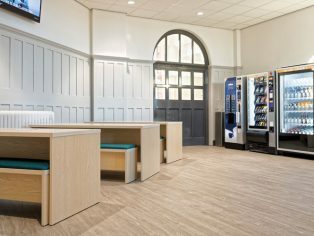 A variety of Polysafe safety flooring products from Polyflor, the UK’s commercial vinyl flooring specialist, were chosen to create a new learning environment for health and social care students at the University of Derby’s Chesterfield Campus. Opened in 1911, the Grade II listed St Helena Building has been renovated as part of a £6.7m project for the university, led by architects Frank Shaw Associates Ltd and main contractors Henry Boot Construction Limited. Polysafe safety flooring was installed around the campus by Nottingham based contractors Diamond Flooring, including in a clinical skills suite, six bed NHS-standard mock ward and an immersive simulation suite which represent a real-life working environment for students to learn in. 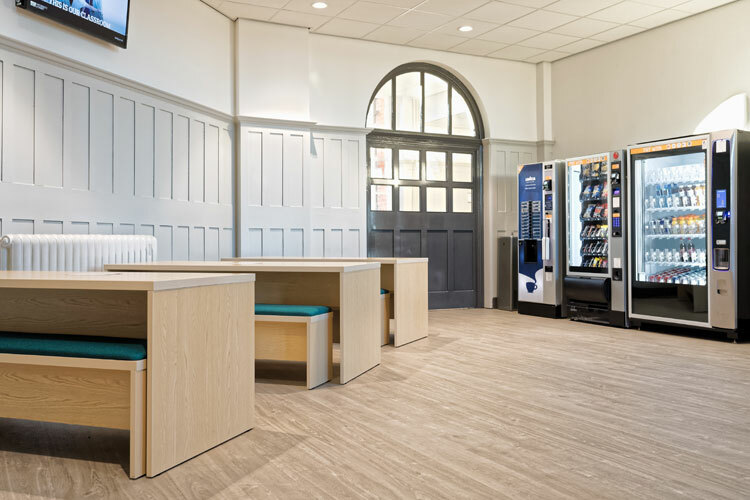 Polysafe Wood fx PUR vinyl safety flooring in Sun Bleached Oak was used alongside textile-effect Polysafe Arena in Steelwool in communal break areas such as the campus refectory. Polysafe Wood fx is a hard-wearing sheet vinyl flooring which combines the authentic reproduction of wood with virtually invisible aggregates to provide traction for underfoot safety without compromising the high clarity look of the floor. Polysafe Verona PUR flooring in the Dolphin Grey and Café Noir shades was selected for the mock hospital ward learning areas. The Verona range’s virtually invisible slip resistant particles and complementary tonal chips offer the high clarity look of a smooth vinyl floor with the performance of a safety floor. Designed to provide sustainable slip resistance in commercial kitchens, Polysafe Ultima flooring in Aurora Grey was also installed in the servery and food preparation areas. The Polysafe Wood fx, Arena and Verona safety flooring ranges are all fully HSE Compliant and classified as low slip potential, achieving a minimum of 36+ on the Pendulum Wet Test and meeting the 50,000 cycles abrasion test which assures slip resistance for the guaranteed life of the product. Polysafe Ultima achieves 40+ in the Pendulum Wet Test, offering enhanced slip resistance in busy kitchen environments where grease spillages may be present. Ease of maintenance in high footfall areas is important so the Wood fx, Verona and Arena product ranges are enhanced with Polysafe PUR, a cross-linked and UV cured polyurethane reinforcement to achieve superior cleaning benefits. Manufactured in the UK, Polysafe flooring contains recycled material and is 100% recyclable via the Recofloor vinyl take back scheme. These flooring collections have certified BRE Global A+ rating (ENP 472) in major use areas to help maximise a BREEAM score. Samples from any of our safety flooring ranges can be ordered free of charge on the Polyflor website or by calling the Polyflor Samples Direct Hotline on 0161 767 2551. Polysafe Wood fx PUR in Sun Bleached Oak and Polysafe Arena PUR in Steelwool at University of Derby, Chesterfield Campus.